In June 2010, I started on my latest recording with musician and producer Gavin Ralston. He helped me arrange and produce several music tracks, six of which include vocals. This was later whittled down to seven tracks averaging six minutes each. One of my ambitions was to feature electric guitars and I am very grateful to Gavin for his sympathetic musical approach in this regard. Éalú – Foreign Links is the title of this recording. Éalú (pronounced “Ay-lou”) means escape, evasion, (unheeded) elopement, passage (of time, of tide). As each of these meanings has significance for me on my continued journey through life, Éalú seemed an appropriate title for the album. Thirteen years have passed since my last musical journey, and it has been a privilege this time to work with 17 telented musicians and five singers from four countries – Africa (Nigeria and the DRC), America, Ireland and Japan. The album contains 10 new instrumental compositions of my own, most of which are contained in the title track, Éalú, which runs to 9.5 minutes. It is also my privilege to feature four new compositions by other musicians – two by Alan Griffin, one by Roger Doyle and the last by an unknown Spanish composer. 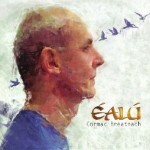 Also included are two songs and five works from the Irish tradition. The new material recorded here, I believe, is all the better within this shared space, drawing on each participant’s recorded contribution, adding varied shades of colour to this album of foreign links. A difference between this album and other recordings of mine is that I do not play any high whistles: I play Susato low whistles in the keys of C, D, Eb, F and G. Also, unlike other previous recordings, there are no reels featured. The Minded set commences with a jig I composed for my partner’s daughters, Yvonne and Alyssa, a few years ago. It is followed by the well-known Old Favourite, a majestic jig and a favourite of mine which allows for some playful arrangement. I am a fan of the blues and jazz and the next piece serves as a link between two musical worlds: the synthesiser heralding the entry into the “other” world and the homecoming, culminating in the wonderful well-known, spacious Butterfly slip-jig. Universal Sun is a children’s song I co-wrote with my partner, emphasising the power of the sun’s heat – a metaphor for love – without which all living things could not survive or grow. The animals in the song from around the world represent the most vulnerable in our society and the song serves as a reminder how the more disadvantaged members of our society, like animals, are exploited too often for personal gain. The song also affirms that in sharing a common need to be warm we share the same basic need to be loved. In acknowledging this basic need we can learn mutual respect and live in world that avoids the temptation of self-destruction. The title track Éalú (Escape) is primarily an instrumental that includes keening to portray a mixture of sadness and happiness. 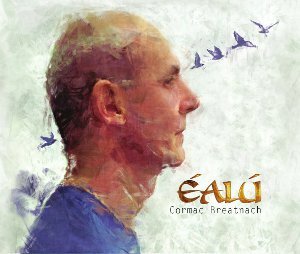 This 10-minute musical journey commences with a caoineadh (an elegy) which is then transformed into a happier emotional state. The Elegy features twice, first performed by a male voice and then by a female. The absence of lyrics – and specific context – allows the listener to participate in his/her own journey and to interpret for himself/herself the shifting emotions that are portrayed by the varied melodies which make up this track. The participation of singer Kokia in Tokyo, with me in Ireland, affords the track a wider international dimension. Land Of Open Welcome? is an arrangement of a well-known Irish hymn that celebrates our patron saint, Patrick. New lyrics, honouring both Saint Patrick and Saint Brigid, were written by the poet Theo Dorgan. His words draw from the strengths of these saints for the Ireland of today in providing guidance and assistance. Although they were written seven years ago, in the present climate of economic depression the words inspire courage and carry an even more poignant meaning for Ireland today; we all need to feel and can be grateful for what we have once we acknowledge the hardships of so many others who remain marginalised in our society and who continue to suffer injustice as a result. I am delighted that the African-American actress and singer, Vanessa Williams, agreed to take time out from her busy filming schedule to sing on this track. The concluding march, The Minstrel Boy is an Irish patriotic song written by Thomas Moore (1779–1852) who set it to the melody of The Moreen, an old Irish air. Here it appears in instrumental form. Steal a Kiss is a slow evocative composition by piano player Roger Doyle, set to a theatrical trailer of my choosing under the banner of 1916. Roger represents a piano player in a Dublin hotel overlooking the General Post Office on Easter Monday, 1916. The GPO subsequently became the symbol of Irish resistance in the 1916 Rebellion against British occupation. While playing the piano in the hotel lobby he is taken by the beauty of a female close by and contemplates amorous advances towards her. Contrasting with this and taking place outside “his” familiar world, he spots through the hotel window green uniformed men in front of the GPO, one of whom is addressing the public by reading the Proclamation. As the pianist begins to focus on this man in green, there arises from his subconscious another melody which stirs within him unfamiliar feelings: this melody sets the stage to a new dawn. Finally, the 17th. century war-like piping tunes symbolise the changed political landscape which was brought about by the Irish Rebels, many of whom made the ultimate sacrifice. The next track is a Foxtrot from the Guadalajara region of Spain. I first heard it played by Galician musician Carlos Beceiro, a member of the Spanish band La Musgaña whose music awakened in me an interest in my Spanish roots when I first heard them in the Azores in 1995. Carlos learned the Foxtrot from Toribio del Olmo, a dulzaina player who appears to be “the guardian” of this melody. Linked to the Foxtrot are two compositions from Irish/Basque musician, with Alan Griffin, who has spent the last 25 years living, playing and recording in the Basque Country. I was first introduced to Alan in May 2007 by film Director Paddy Hayes while filming my musical journey in the TG4 programme Ceolchuairt. Alan’s CD Lau Anaiak with his group Alboka inspired me, and stirred in me a new awakening of my own Basque roots. The final track is a lament dedicated to the memory of my parents, who died within two days of each other in October, 2007. The opening melody inspired Aoife Doyle to compose her haunting lyrics. Thank you, Aoife. The lament bears the title of my father’s own family blessing which he gave as he parted company. “Slán agus Breatnach”, means “Goodbye and Breatnach”, a pun on the Irish farewell, “Slán agus Beannacht”, “Goodbye and a Blessing”. The track is in four parts and deals with my parents’ lives in reverse order; (i) a call from the grave; (ii) their funerals; (iii) their lives; and (iv) their first breath of life.